When Sea-Doo throws a party and you get the invite, you spontaneously high-five the guy behind you in line at the convenience store. Then when you find out it’s because Sea-Doo is celebrating their 50th anniversary and are teasing you with industry changing advancements that they’re keeping tightly under wraps, you add a scratch ticket to your collection of overpriced sinful snacks, because today is definitely your lucky day. And when you find out that Tim McKercher is the person putting it all together and is promising “something BIG”, you toss a handful of cash at the bewildered clerk, sprint out of the store, race home, pack your bags, and upon realizing that October 1st, 2017 is still a long ways off, you fervently and silently condemn everyone who has ever theorized that time travel is possible, but have yet to figure it out. 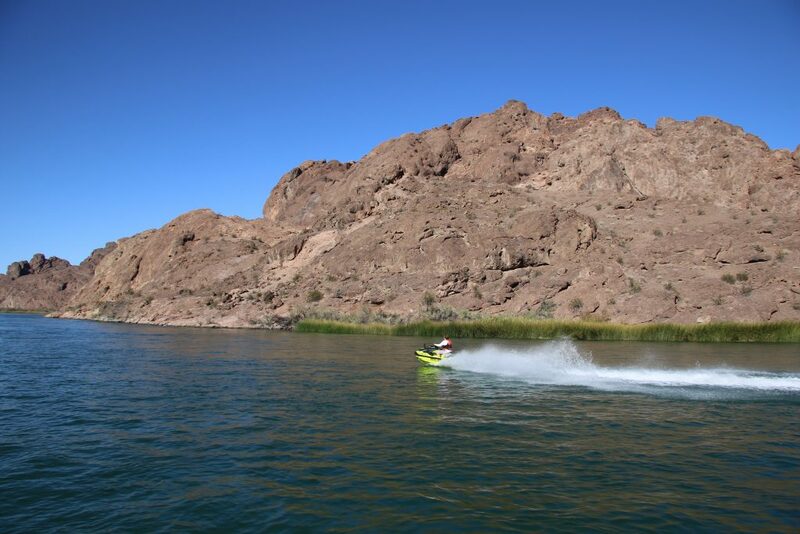 So, even if that’s not exactly what happened, it definitely felt like that when producer and host of PowerBoat Television, Steve Bull informed me that we would be heading to Laughlin, NV to take the brand new 2018 Sea-Doo models for a run along the Colorado River to just south of Needles, CA. And if you’d ever been to a Sea-Doo media event organized by Tim McKercher you would understand that my level of excitement was well justified. I’ve had the pleasure of knowing and working with Tim for over a decade, and as the President of Look Marketing, he is the driving force behind every successful Sea-Doo media event. As a former Sea-Doo team racer, Tim lives all things Sea-Doo. 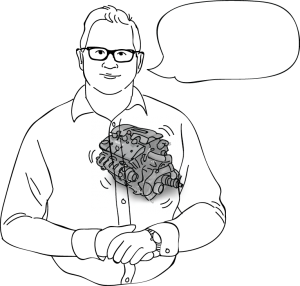 Let’s put it this way, if I didn’t know that it was anatomically impossible I would swear that in his chest beats not a heart, but a Rotax engine that pumps race gas through his veins. No that’s not over-selling things, nor is it over-selling Tim and his ability to deliver time and time again when it comes to launching new product on behalf of Sea-Doo. So when he told Steve that it was “something BIG”, and that we definitely would be impressed, that was all we needed to hear to get us counting down the days. After what seemed like forever, October 1st has finally arrived, so Steve and I hop on a plane and jet off to Las Vegas, NV. 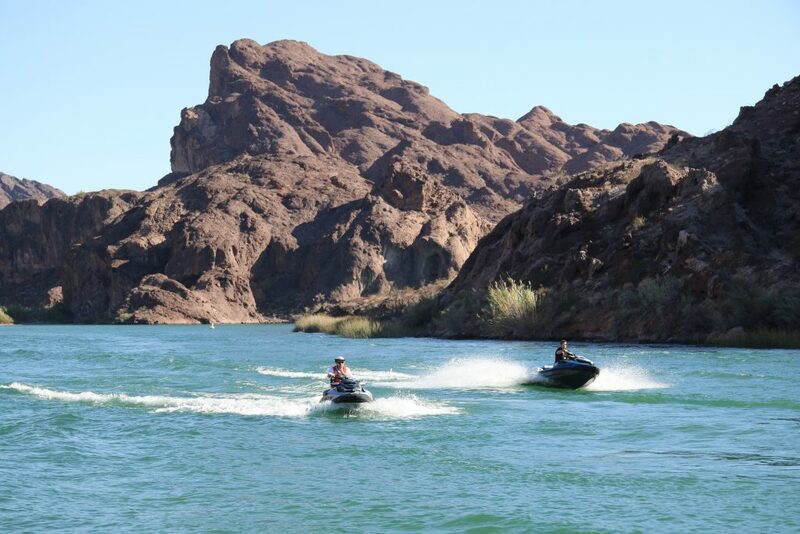 A couple of hours after touching down, we are greeted by the team from Sea-Doo as we check into Harrah’s Laughlin Hotel & Casino on the Colorado River. Later that evening, the assembled media from across North America and as far away as Japan and Australia are given the chance to finally get up close and personal with one of the new 2018 models. While Sea-Doo officially debuted the 2018 watercraft line on September 20th, 2017 in Dallas, TX, for most of us, this is the first time we’ve had the chance to see a new model in person. As I start to take in the individual features of the sharp looking black and blue RXT displayed on a stand and lit up with floodlights, I have to stop myself from imagining that perhaps impatience got the better of Steve and I, and maybe we knocked together a time machine and actually did travel into the future, except we overshot our landing by a decade or so. Taking out my phone to snap a few photos I check the date: nope, definitely October 1st, 2017. The most noticeable and radical new feature is perched proudly on the rear deck of this futuristic watercraft. 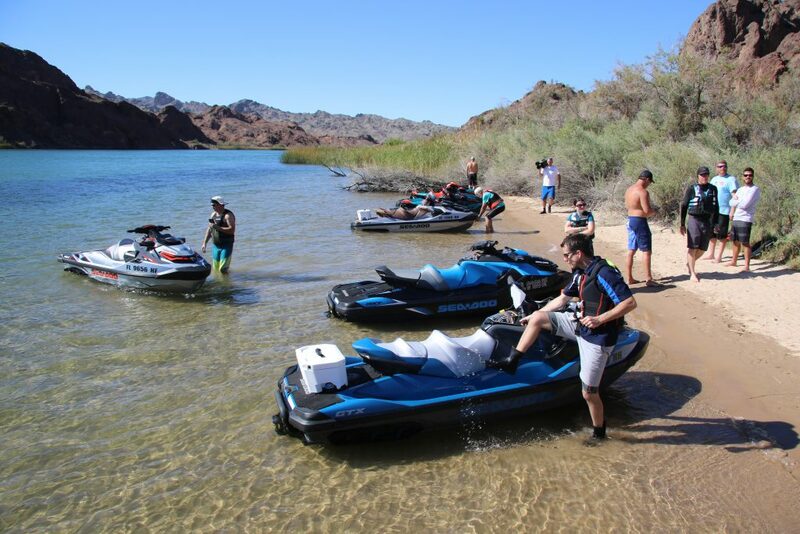 The engineers and design gurus at BRP (Bombardier Recreational Products, parent company of Sea-Doo) have incorporated their proprietary LinQ Attachment System into the rear platform. This new quick-attach rear cargo system allows for simple easy-snap accessory connection in seconds without tools. It can accommodate 4 different accessories: a 15L (4 gallons) fuel caddy; a 21L (5.5 gallons) semi-rigid cargo bag; a 16L (4.2 gallons) rigid and weather-resistant cooler; and a high-rise ski pylon. What is really ingenious is that you can stack the cargo bag and fuel caddy on top of each other, as they’ve done with the model currently in front of us and they will remain securely in place at any speed. It is also worth noting that these accessories can be easily removed, and the latches recede to sit flush within the larger, redesigned rear deck. It’s quickly becoming very apparent to everyone present, that this redesign is industry changing, and I haven’t even mentioned one of the coolest new features already stealing the show. Built-in speakers! 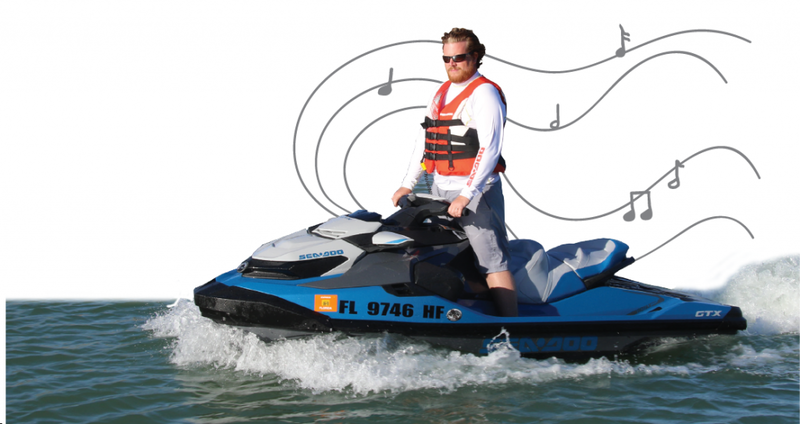 For the first time ever on a personal watercraft you can now cruise along and explore your surroundings with your very own personal soundtrack, courtesy of a Bluetooth, fully integrated, and completely waterproof, 100-watt audio system. It’s at this point that I realize that the music I’ve been hearing since we arrived is actually coming from the speakers integrated into either side of the RXT itself. What a time to be alive! The next morning as Tim and the BRP crew brief the media on the plethora of new features available on the innovative new platform, I head on down to the river’s edge to capture shots of the new line-up before we head out. 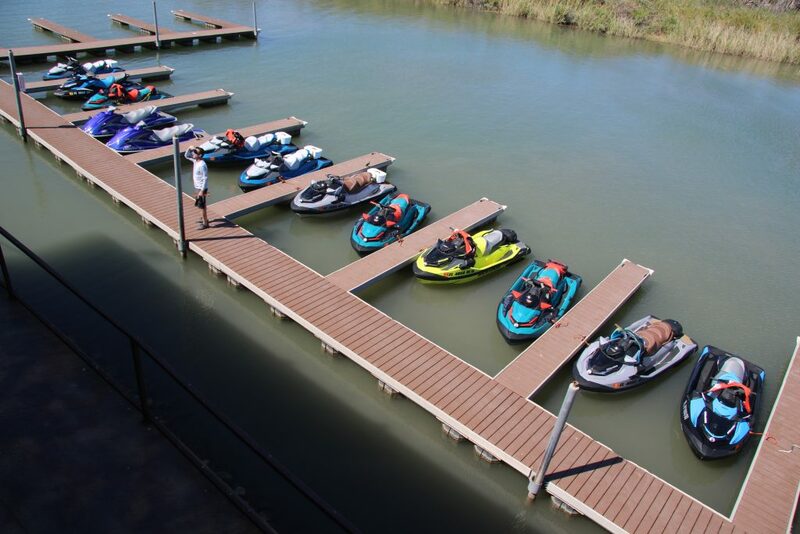 The new platform, available on seven models across the Sea-Doo GTX, RXT and WAKE PRO families is on full display with over a dozen watercraft, lined up, fueled up and ready to rip! Our final destination is Pirate Cove Resort & Marina just south of Needles, CA, and approximately 35 miles downriver, as the crow flies. Navigation can be a significant challenge along this route, due to fluctuating water levels and many shallow sections. So, because of that Sea-Doo has very wisely chartered a sleek aluminum beast of a jet boat, from London Bridge Jet Boat Tours to lead the charge and serve as our camera boat. I hop aboard with the other cameramen and photographers and our convoy of cutting-edge watercraft is off on an adventure to tame the swirling waters of the rugged Colorado River. Along with a steady current, there are large expanses of water along this section of the Colorado that alternate between choppy and calm as the high sandstone cliffs rise and fall on either side of the river. This mix of riding conditions makes it the perfect proving ground for these new models. We stop often as we make our way along the brilliant emerald ribbon that winds its way through the desolate Mojave Desert. While I film from the jet boat, Steve takes turns swapping Sea-Doos with other members of the media. Swapping Sea-Doos leads to swapping stories and thoughts on the new models over lunch at the landmark Topock66 restaurant. 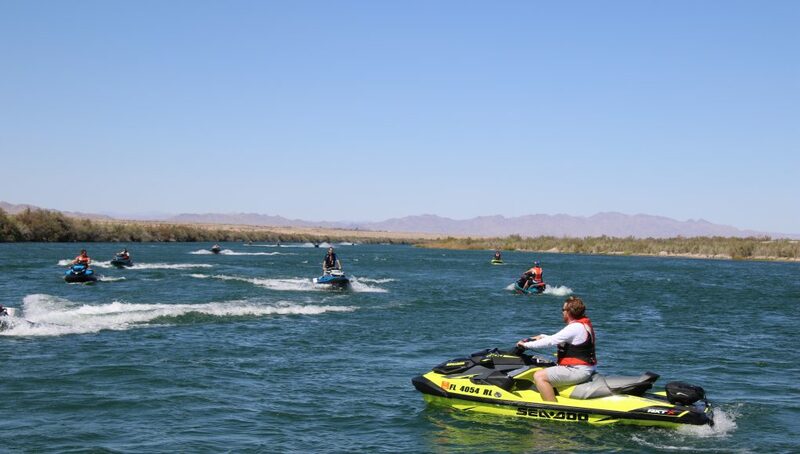 By this time it is unanimous, the new platform for the 2018 Sea-Doo watercraft line is a huge hit! Steve tells me how impressed he is with the audio quality from the speakers as he marvels at their ability to almost create a cocoon of sound around the rider while underway. Everyone is raving about the stability of the new platform, which comes by way of some very impressive engineering. BRP figured out how to not only lower the center of gravity and make each model wider, but they did so while also reducing the weight by up to 90 pounds from previous model years. With the hot desert sun hanging low on the horizon our swashbuckling crew hunkers down for the evening at the Pirate Cove Resort & Marina to trade tall tales long into the night in spite of preparations to hit the water bright and early the next day for more testing and filming. 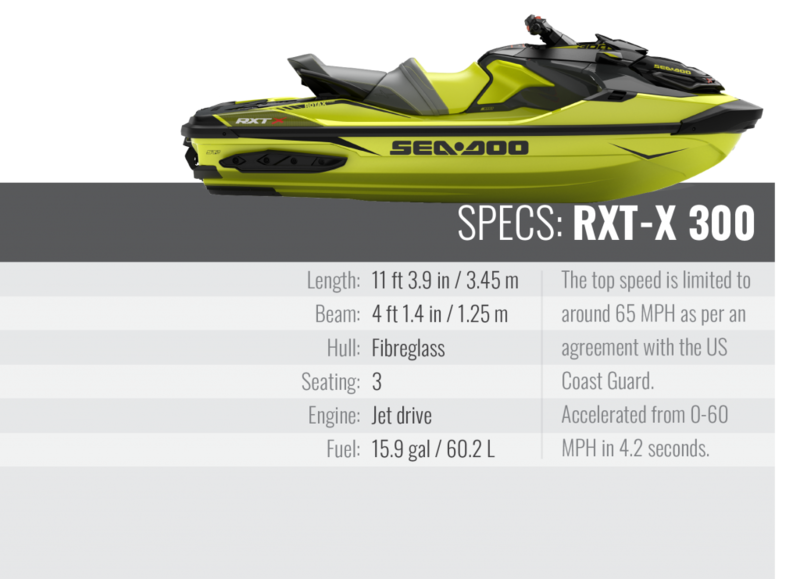 Before heading out in the morning, Steve and I spend some time with Sea-Doo Global Manager, James Heintz as he takes us through more of the innovative new features onboard a 2018 RXT-X 300. Most noteworthy is the cavernous 102.5L (27 gallons) direct-access front cargo compartment located directly under the handlebar. Gone are the days of having to lean over the handlebar to access your stowed gear. Thanks to this revolutionary new design you can now access everything directly from a seated position. Turning our attention to the back of the watercraft, the innovation continues, as James demonstrates the modular rear seat. 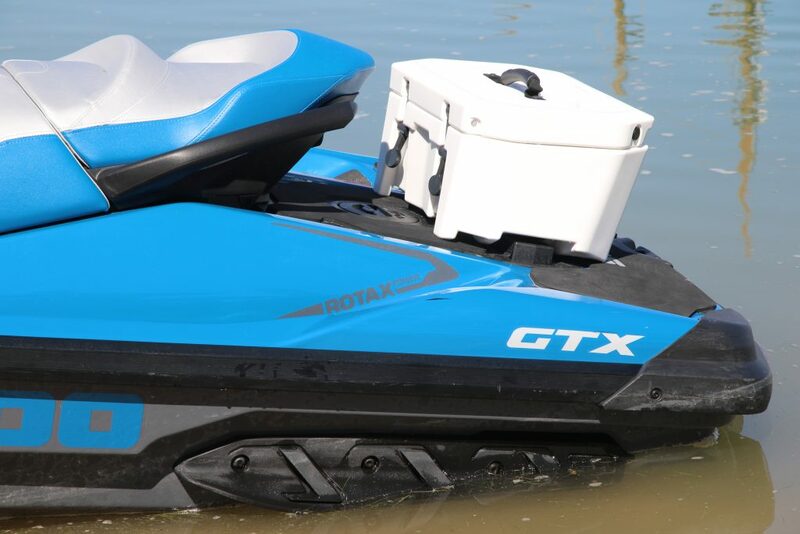 He effortlessly removes the seat, instantly converting the RXT-X from a three-rider model to a one-rider craft. With the seat removed it creates a massive space at the rear where you can kick back and relax, or if you choose to, you can place the modular seat further back on the rear deck, put the cooler in between for use as a table and enjoy a picnic lunch facing your partner. Tempting as that sounds, lunch is still a long way off and Steve and I have big plans for this RXT-X 300 that we’ve managed to wrangle away from our media brethren. As we head a little further south, the dusty beige sandstone cliffs have given way to towering rusty windswept rock and I must confess, as impressive as these new Sea-Doo’s are to look at, it’s sometimes difficult to keep from getting distracted by this amazing scenery. Finding a secluded spot in the beautiful Topock Gorge, we focus our attention on the task at hand, as we’ve saved the testing of one of the best features for last. A big part of the new 2018 platform is the complete redesign of the hull. The RXT-X 300 that Steve is preparing to put through its paces features the new ST3 hull. Not only is it wider, but it also boasts a deeper V shape with both soft and hard integrated chines that increase performance in rough water and provide better control while cornering. With my camera set up on a beach for some high-speed running, and tight turn shots, Steve grabs some throttle and happily obliges. He twists and turns and zigs and zags and through the viewfinder, I can see his smile only growing larger. Engaging “Launch Control”, an advanced and easy-to-use handlebar activated system that automatically adjusts the pump angle to provide perfectly controlled acceleration every time, sends Steve rocketing off down the river and out of sight. 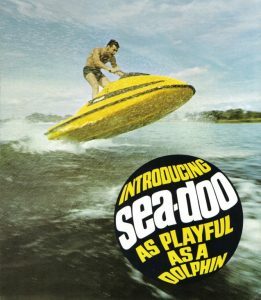 As I turn my camera toward capturing some beauty shots of the stunning scenery that surrounds me, I too find myself smiling as I think about how far Sea-Doo has come since they launched the first personal watercraft way back in 1968. So congratulations BRP, you’ve done your predecessors proud. Not only is the new 2018 Sea-Doo platform “something BIG”, it’s also the culmination of 50 years of industry-leading innovation, and that is definitely something worth celebrating!